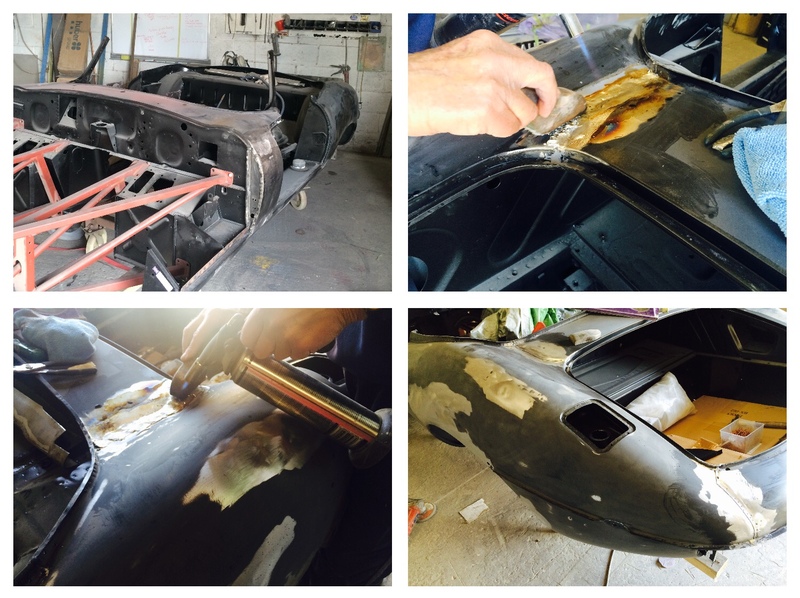 Jaguar Etype series 2 convertible body restoration project. 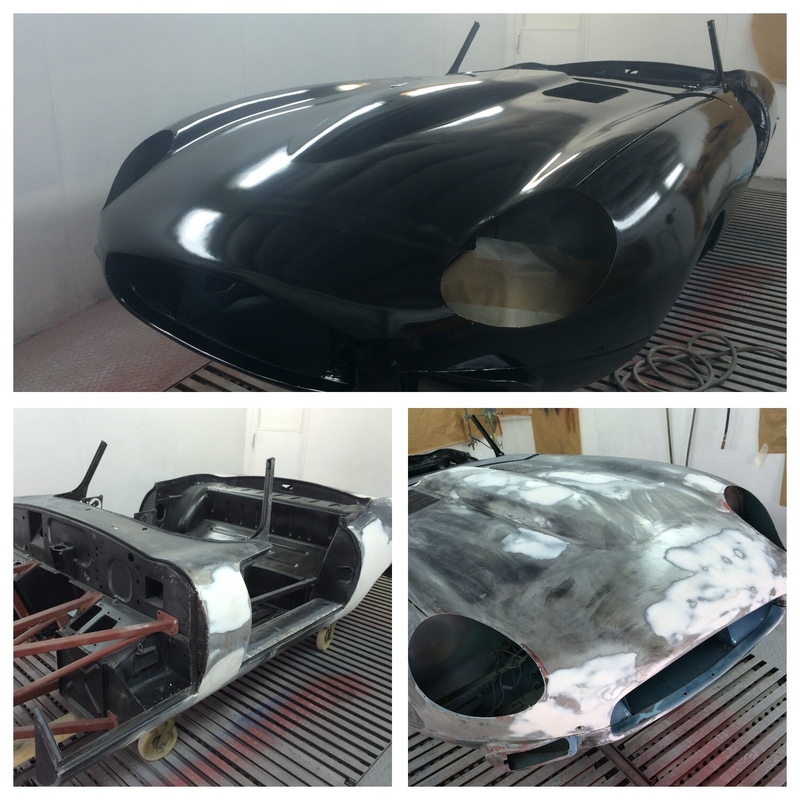 When this convertible series 2 Jaguar etype arrived with us it had already been dip stripped and the bonnet had the paint removed courtesy of a 36 grit sanding disc which had certainly left its mark in the metal. 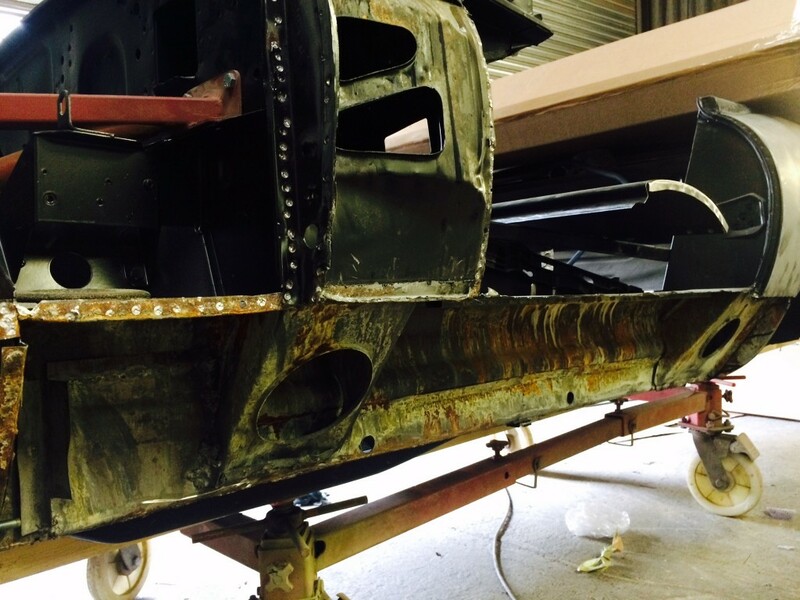 The floors had been replaced and some welding had been carried out on the sill panels. 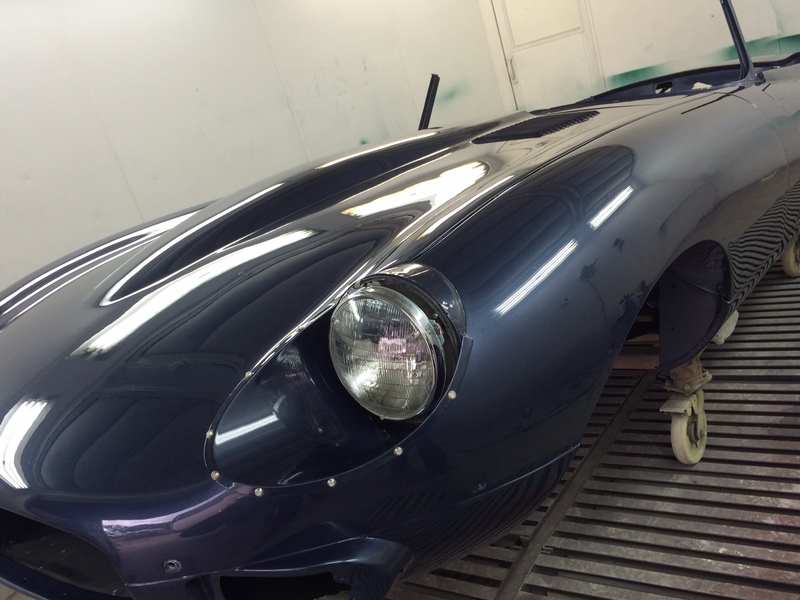 When it comes to restoring the body of a Jaguar etype I first like to asses the bonnet fit so we mounted the bonnet and the Initial bonnet fitment results revealed problems relating to gap evenness down the A posts. A closer inspection revealed that the outer sill panels had been bent to make them align with the bonnet, both sills had been bent downwards and out from the body to make it look like the bonnets fit was good look and although the sill panels had been previously repaired the metal looked perforated in areas so we decided our first was to replace the outer sills. With the sill panels removed it was obvious that the dipping company had forgotten to E-coat inside the sill panels (having removed the panels we decided that now was the best time to rust protect this area). 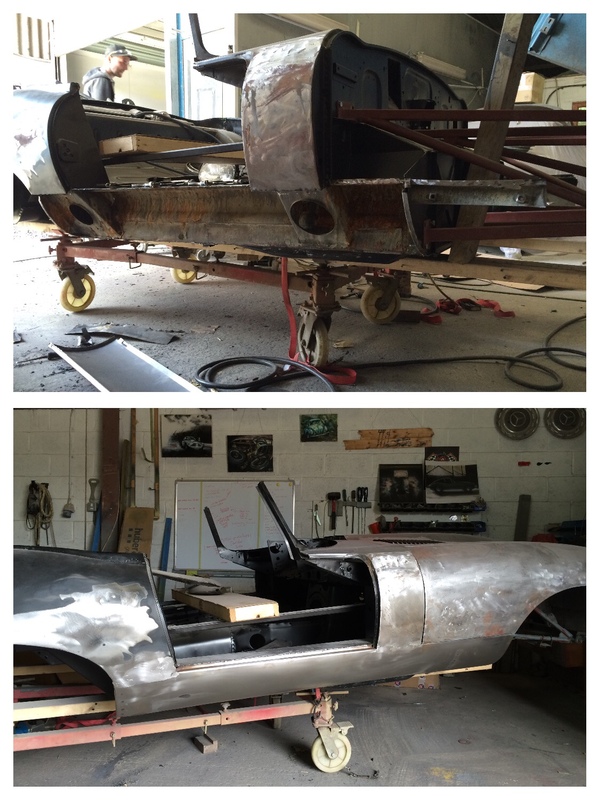 E-type Left side ‘A’ post and sill panels removed with no ecoating inside. Metal condition as delivered to us. Rust free but brutal paint removal left massive grinding marks and deep gouges. Note the crease in the left hand side of the mouth where the jaguar etype had obviously collided with another object at some point during it history. Whilst our apprentice set about re-surfacing the bonnet skin, the rest of us set about straightening out some of the dents in the rear tub. The vast majority of dents removed with a bit of persuasion from the Hammers and Dollies whist a couple required finishing with lead. A sample of dents and creases in the rear tub. 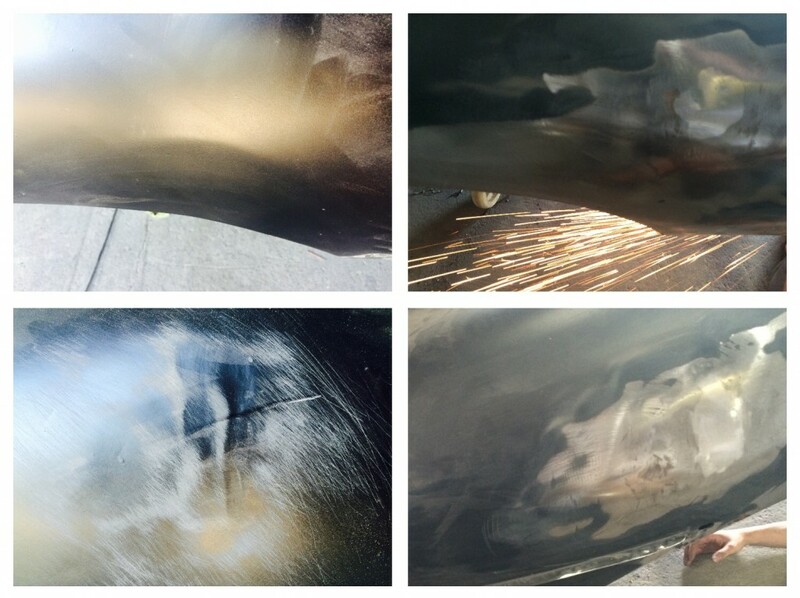 Left image is before right is after repair. 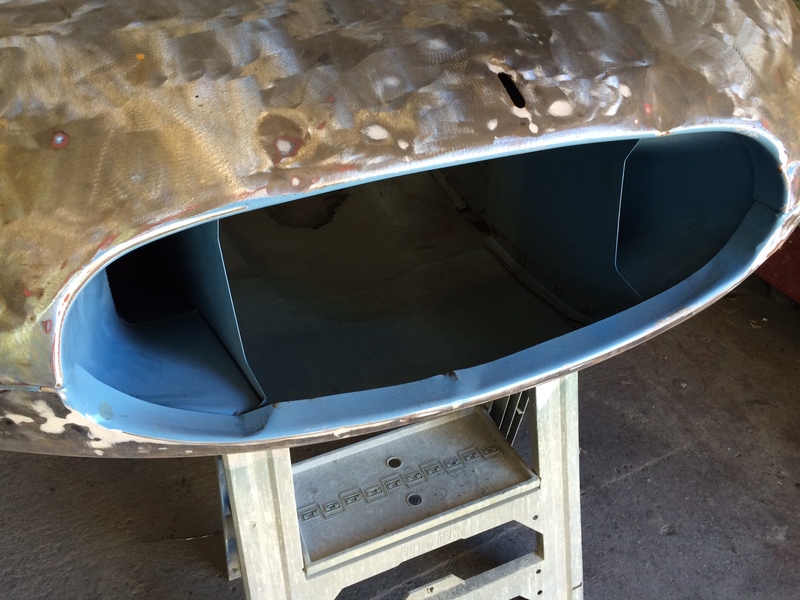 With the first stage of panel straitening completed we then proceeded with the lead loading of the jointed seams – Rear scuttle and rear panel too rear wing tops – front and back of both sills to the ‘A’ and rear wings – front scuttle panel to ‘A’ post panel tops – bonnet seam under head light sugar scoops. 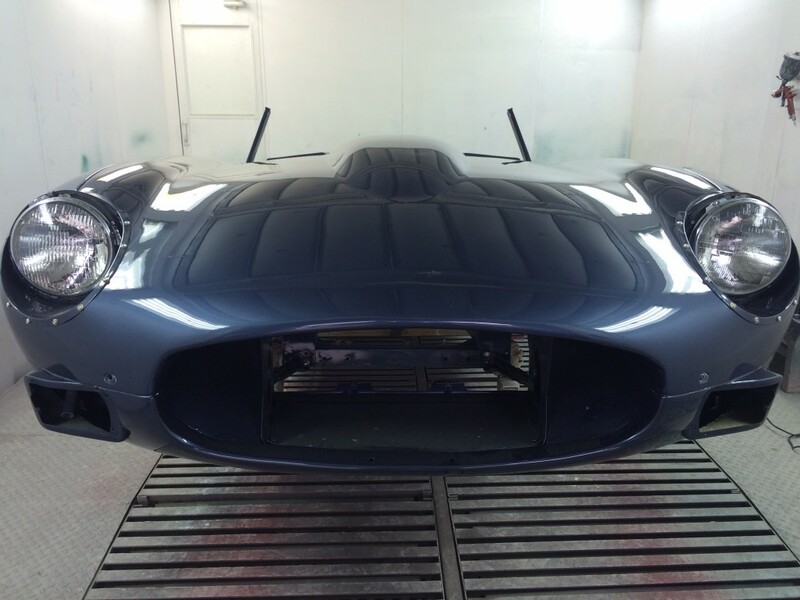 The Owner of this etype requested some basic modification to the body. 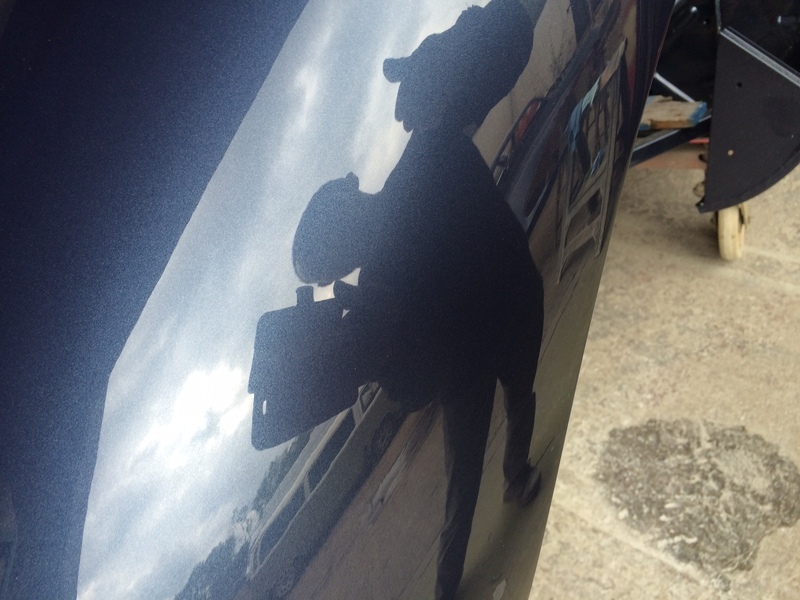 As he was not a fan of the full width rear bumper he asked that we remove the rear lip between the over-rider positions and weld the seam closed. Us spec side repeater holes removed. 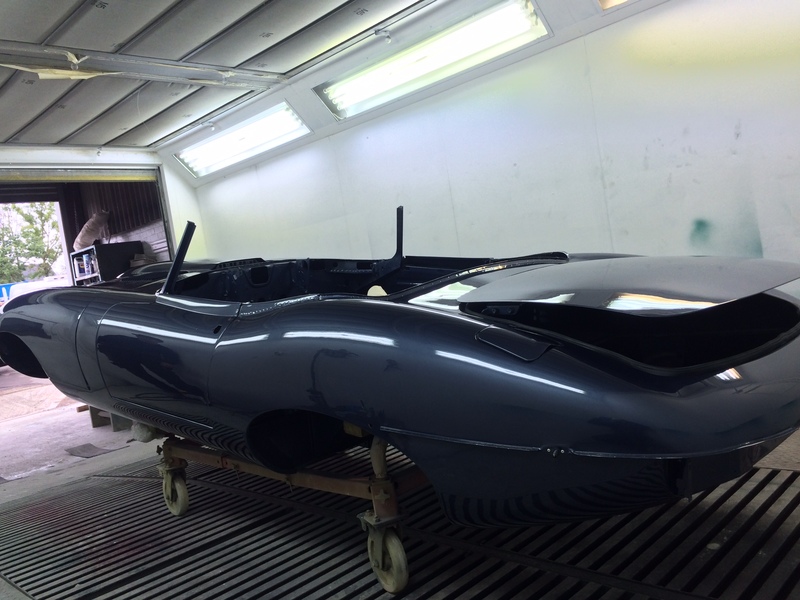 Once all the body panels where repaired and in reasonable shape a thin coat of filler was applied to help with final shape and then the entire body was epoxy primed (tough, durable and non porous with good adhesion properties). Sand epoxy to reveal any high of low uneven areas in the body – correct problem areas with hammer and dolly or heat shrinking as appropriate and fill if required. 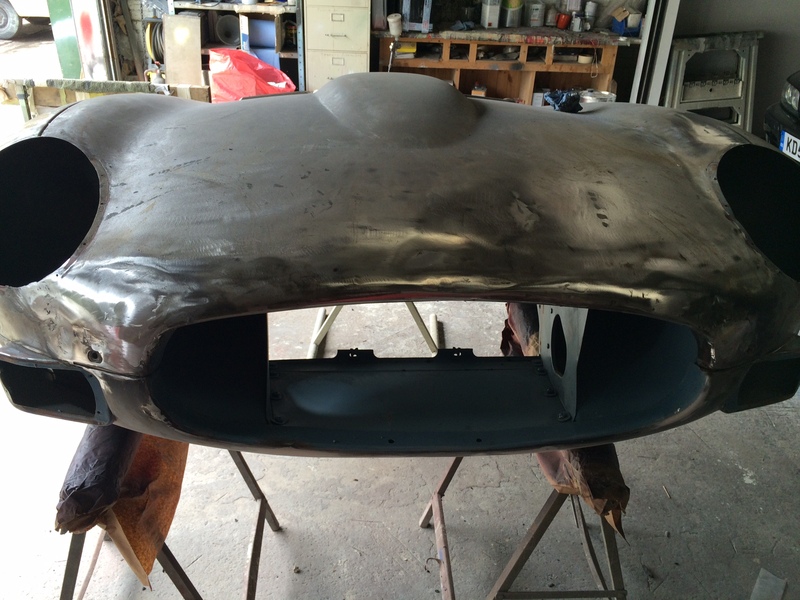 2K high build prime the body, rub down to further identify and refine high and low areas in the panel. 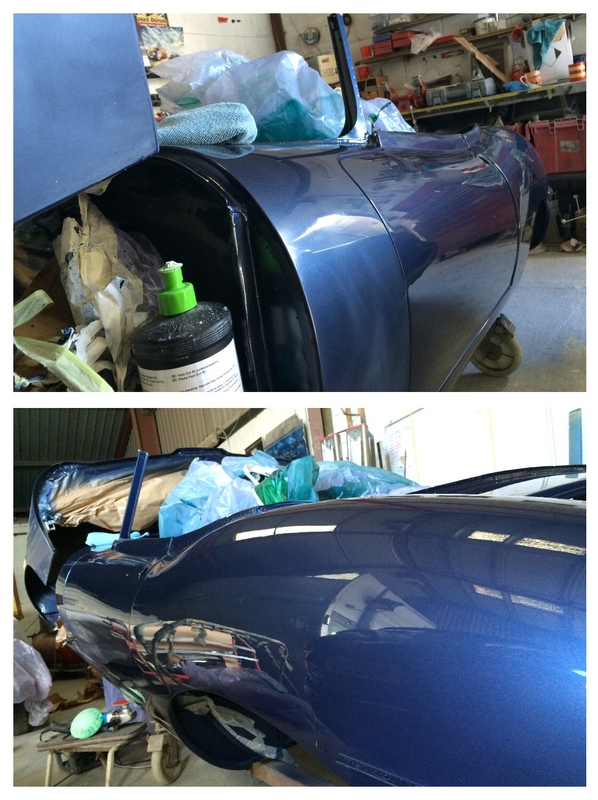 Colour sand the outer body and polish to high gloss low/no orange peel finish. Finally getting some colour on to the areas that will be inaccessible once assembled for outer body colour application. Solour sanding and polishing. 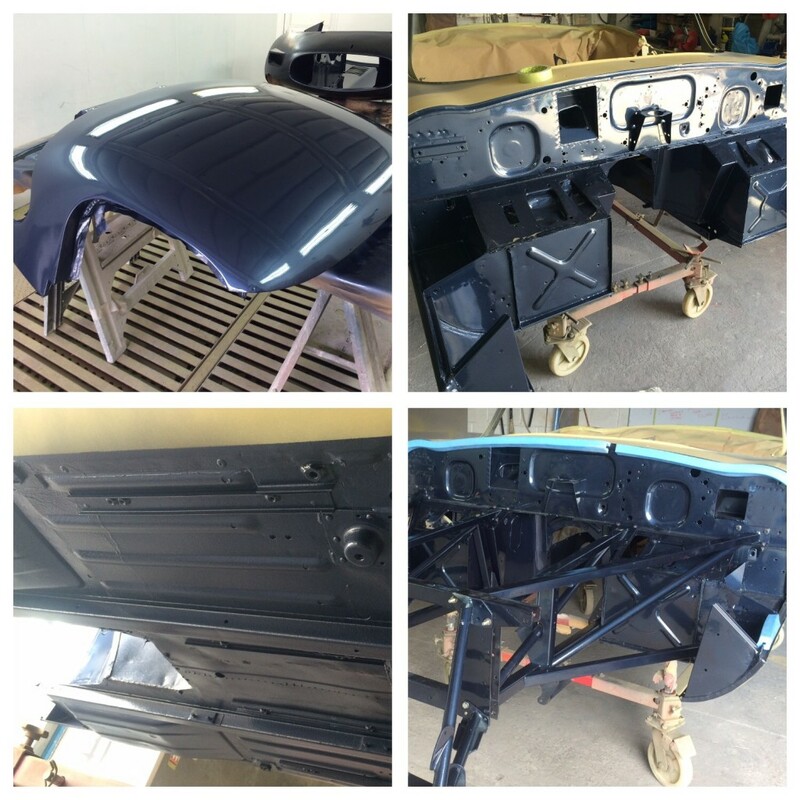 Note the flat paint in the top picture where the new paint has been sanded. 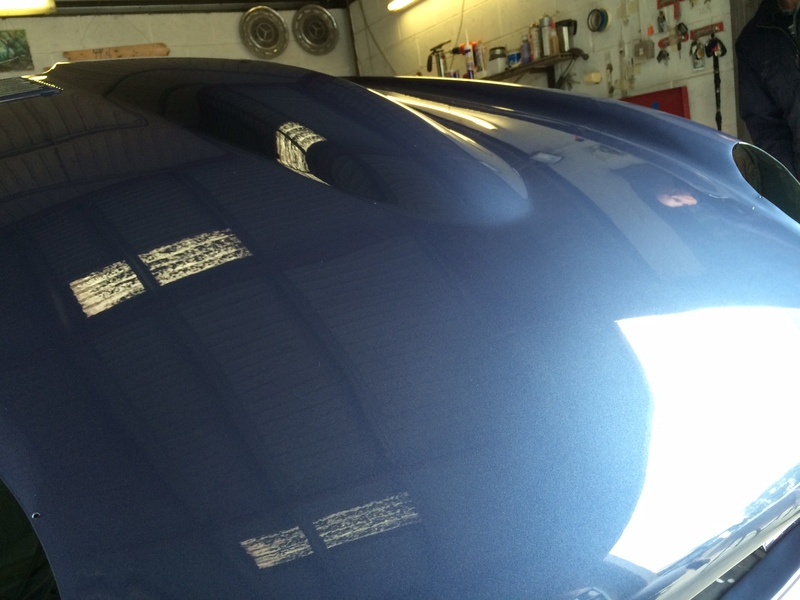 The ‘A’ post is during the buffing and the rear wing is polished back to high gloss shine. nearly there, few detail areas to go. 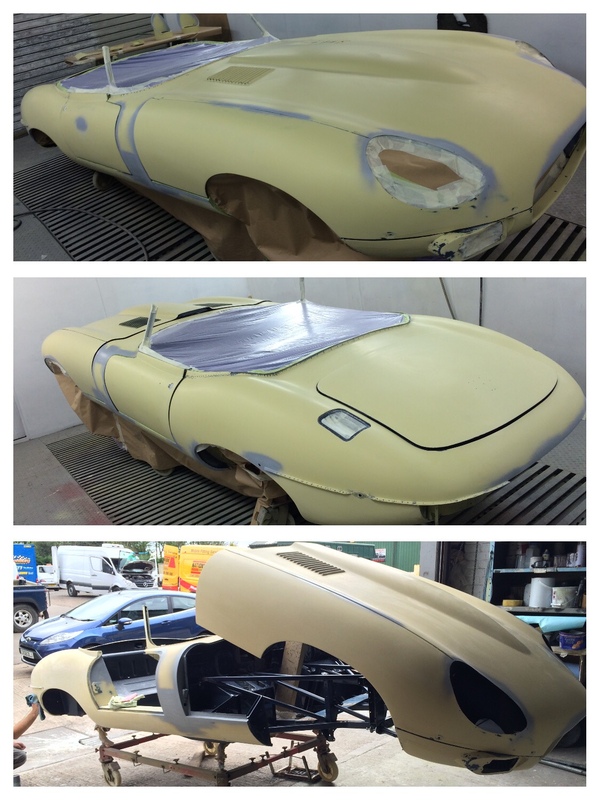 This entry was posted in Paint jobs and tagged etype, full respray, jaguar, restoration by The Paint Shop Pros. Bookmark the permalink. What a brilliant job Gavin did. 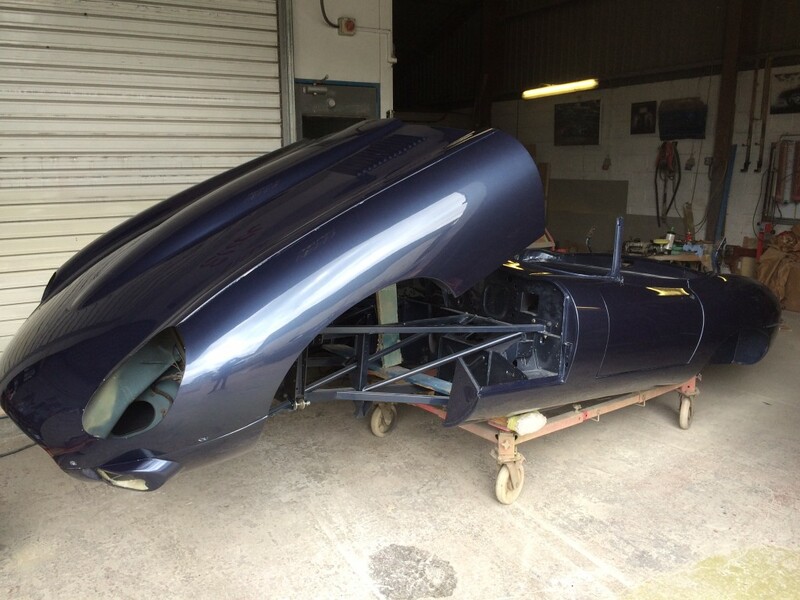 I strongly recommend PSPros to anyone who wants a top class paint job, and Gavin can pull together all of the other ancillary non-finishing skills, such as welding, brazing and a bit of upholstery too to make it all happen. I only wish I had just given him the shell first, rather than letting a couple of other parties have a go at prepping it first. Thank you Steve. We really enjoyed doing the work and she looks great. Hoping that you will bring her down on a nice day once she is back on the road.